Is A Labrador A Good Family Dog? Is this Popular Dog Right For You? Is a Labrador a good family dog? Is this popular choice the best fit for your family? Labs are known for their friendly temperaments and loving natures. But is that all that matters? Are Labradors easy to train? Do Labradors shed a lot of hair? Do Labradors bark a lot? It’s important to know what you want from a dog when you’re considering a Labrador as a family pet. So let’s look at what a pup or rescue dog from this breed can bring to your home. And whether a Labrador is a good family dog! Are Labradors Good Family Dogs? If you’re wondering do Labradors make good family pets, it’s a good idea to know what qualities make a good family pet to you. If you have a big family, perhaps it is important to have a dog that loves being social and spending time with you all. Maybe you’re a family that likes to be active, so a pet that loves to exercise and play is what you need. If you’re a family that is quite close knit, you might want a dog breed that is loyal and affectionate! Perhaps you’re looking for a dog that’s good with young children. Or one that has a long lifespan that can be a part of your family for a long time. So is a Labrador a good family dog? 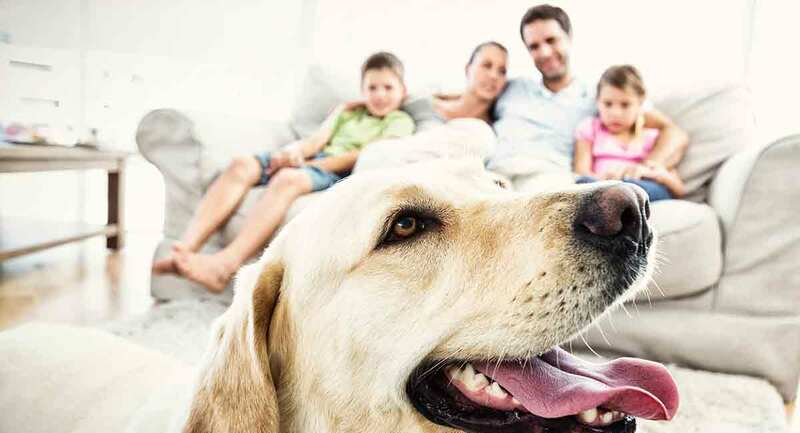 Let’s look some more at the different qualities and characteristics Labradors commonly have to decide are Labradors good family pets. If you’re thinking of getting a Labrador family dog, you’ll need to know how well their personality will fit into your home! So let’s look at some of their common characteristics to help decide if Labs are good family dogs. One of the most famous traits that guarantees a Labrador is a good family dog is their friendliness. When socialized properly from a young age, Labradors grow up to be friendly and confident around people and other dogs, which makes them great for families. If you want a dog you can take with you wherever you go, and that will be happy in almost any situation, Labradors are a great option. Proper socialization as a puppy helps to minimize any aggression or fear in adult Labradors. Even though the breed is already known for being affectionate and amiable. This friendliness contributes to the strong bonds Labradors tend to form with their family members. Therefore, Labradors really will become a member of your family! Another great quality that makes Labradors such great family pets is their energy. Their easy-going, friendly nature doesn’t mean they’re a lazy breed! Labradors are medium to large dogs that require mental and physical stimulation every day. This can be in the form of playing or exercising! If you’re in a big family with lots of kids that are excited about your new pet, Labradors are the perfect choice! They love to play, receive attention and affection, and be involved in activities you and your family do. If you’re quite an active family that wants a dog you can take on walks or play games with, a Labrador is a good choice. But this isn’t all that Labradors love! They love affection and cuddles from their family, just as much as they enjoy exercising and playing, so you get the best of both worlds with a Lab. Training is a huge element of what makes a great family dog. Training not only ensures your dog is well behaved, but it can also be really good fun and rewarding for everyone involved. Labradors have been shown to respond really well to training, especially when their owners are open and encouraging. This intelligence is why Labradors are such a popular breed for roles that require lots of training. Some examples include guide dogs for the blind or even military training dogs that detect explosives! Labs are not usually noisy dogs but if you find yourself with a Lab that barks a lot you may find this training article helpful. Training doesn’t always have to revolve around commands like sit or heel. It can also be great fun for the younger members of your family, who might enjoy teaching your dog new impressive tricks! Things like this will really help your Labrador fit right into your family! Is A Labrador A Good Family Dog For Me? Of course a Labrador isn’t going to be the best choice for everyone’s family. So it’s also good to consider the reasons a Labrador might not be the best family dog for you. Even though Labradors have tons of great qualities, this isn’t the only consideration you need to make. When asking yourself, is a Labrador a good family dog, it goes both ways. You need to also consider whether you will be able to provide a Labrador with everything it will need to be happy and healthy! Labradors are quite big dogs. So it’s important to make sure you have the space to keep one in your home. And, as mentioned earlier, they require lots of exercise. Whether you take them on hikes, take them swimming, or go on walks with them. This can be a downside to Labradors for people who don’t have the time to give these bigger dogs the exercise they need. Labs don’t need a lot of grooming but you may need to give them a brush now and then. Because Labradors have a life expectancy of 10–12 years, it needs to be remembered they are a long-term commitment! You need to make sure you will be able to provide your pup with what it needs for its whole life, not just for a few years. If, however, you have the space, time, and commitment for a larger family pet, Labradors are the perfect choice for you. Hopefully this article has helped you decide yes or no to is a Labrador a good family dog for you! If you want a dog that is affectionate, friendly, and always eager to get involved with activities and fun, a Labrador is the perfect choice! If you have a Labrador at home let us know in the comments below how they’ve fit into your family. What is your answer to, “Is a Labrador a good family dog,” and why? Sarah E Lofgren et. al. 2014. ‘Management and Personality in Labrador Retriever Dogs’, Applied Animal Behaviour Science. Borbala Turcsan et. al. 2011. ‘Trainability and Boldness Traits Differ Between Dog Breed Clusters Based on Conventional Breed Categories and Genetic Relatedness.’ Applied Animal Behaviour Science. Barbara L. Sherman et. al. 2015. ‘A Test for the Evaluation of Emotional Reactivity in Labrador Retrievers Used for Explosives Detection.’ Journal of Veterinary Behavior: Clinical Applications and Research. J. B. Cole et. al. 2004. ‘Population Structure of a Colony of Dog Guides’, Journal of Animal Science.